Garand Thumb in Thomas Pynchon's "Gravity's Rainbow"
Thomas Pynchon won the 1974 U.S. National Book Award for Fiction for his novel Gravity's Rainbow. It is not an easy read. Like all of his novels, it is complex with many references and allusions to a wide range of specialized topics. Set within the military and the intelligence community during the last year of World War II, one of these topics is the M1 Garand rifle. Pynchon served for two years in the U.S. Navy, studied engineering physics at Cornell, and was a technical writer at Boeing. His writing is influenced by all those experiences. About three-quarters of the way through the novel (on page 594 out of 776 in the Penguin Classics Edition) a passage discusses the dreaded Garand Thumb. As you should learn, you must be careful when loading the M1 Garand. Push the loaded en-bloc clip into place with your right hand. Your thumb pushes the clip down into the magazine area while the heel of your hand blocks the operating rod handle from moving forward. 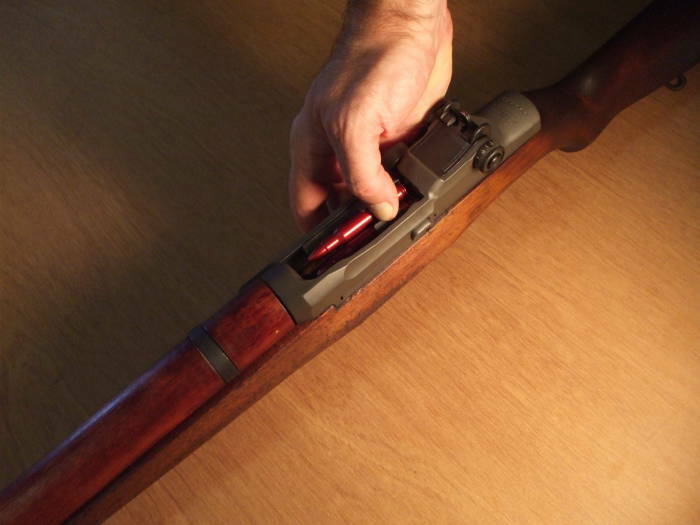 If you are hesitant about pushing the clip into place, or if the heel of your hand knocks the operating rod handle backward with the clip partly inserted, the operating rod will slam the bolt forward in a painful attempt to chamber your thumb as the next round.